In WA, you have a general right to silence, which means you do not have to answer most questions from police. There are some questions you must answer, for example, your name, address and date of birth. If the police tell you that you must answer a question and you do not answer or you lie, you may be charged with an offence. What should I do if police want to speak to me? Give your correct name, address and date of birth. Do not answer any other questions, unless the police tell you that you must. Do not lie or give false information - this is against the law. Do not sign anything until you have had legal advice. Do not resist police, or be abusive or violent. If you try to stop police or make it harder for them to do their job, you could be arrested and charged with a serious offence. If the police want to do a video recorded interview with you, tell them that you want legal advice first. If police give you a move-on notice, make sure you read it carefully and follow what it says. You can be arrested and charged just for being somewhere covered by the move-on notice. How do I use my right to silence? If the police ask you a question, you can say, 'No comment' or say nothing at all. The right to silence does not apply to all questions. If the police ask for your name, address or date of birth, you must answer and you must tell the truth. 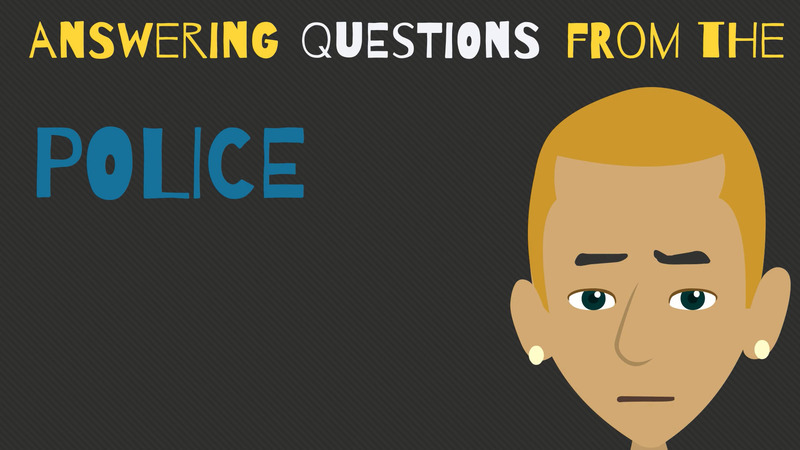 Sometimes there are other questions you must answer – the police should tell you when it is one of these questions. If you are not sure about whether you must answer a question, you can ask, 'Do I have to answer?' If the police tell you that you must answer a question, and you refuse or lie, you could be charged with a criminal offence. If you decide to use your right to silence, the police cannot force you to answer, or use this against you later in court. What if the police want to interview me? If the police ask you to do an interview, you can say no. If you are under arrest, the police might make you sit in the interview room, turn on the video camera and ask you questions anyway. This does not mean you have to answer – you can still use your right to silence. You should always get legal advice before you do an interview or answer questions from the police. You can say to the police, 'I want to speak to a lawyer.' If you do that, the police must give you the chance to call a lawyer. You can call the Legal Aid WA Infoline for free advice about doing an interview. If you decide to do an interview it will be recorded. The police can play it later in court and use it as evidence against you. If you are under 18, ask for an adult you trust to be present at the interview. What other powers do police have? Police have many powers to investigate crimes. In certain situations, they can search you or your property, arrest you, take your fingerprints or DNA, or order you to do something. Often they do not need a warrant. If the police ask you to do something and you are not sure whether you have to – you can ask, 'Do I have to?' If the police say that you must and you refuse to co-operate, you could be charged with an offence. What if the police don’t treat me fairly? If you don’t like the way you are being treated by police, take down the name and number of the officer and get some legal advice about how to make a complaint. If you are injured, see a doctor as soon as possible.